For your stay to be as comfortable as possible on Camping Petite Suisse, listed below is the most important information (opening hours) facilities and costs. On arrival at Camping Petite Suisse, you will receive a welcoming brochure with all the important data listed. During the year, the reception of Camping Petite Suisse has varying opening hours. During the low season, the reception is open daily from 08h30 to 17h00. During the high season this will bdaily from 08h30 till 21h30. The actual opening hours of the reception can be obtained on site. In case of a late arrival, you can go to the bar in the main building. Someone will welcome you over there at Petite Suisse. If the bar is already closed, you can report until 23h00 via the intercom at the barrier. After 23h00 it is no longer possible to drive with your car over the camping. If you expect to arrive later than 17:00, it is desirable that you indicate this to the reception. During your stay you can visit reception for all your questions during your opening hours. * For rental items a cash deposit may be required. We recommend bookings in advance for rental items due to availability. At Camping Petite Suisse can be paid in cash, with card (maestro) and with creditcard. 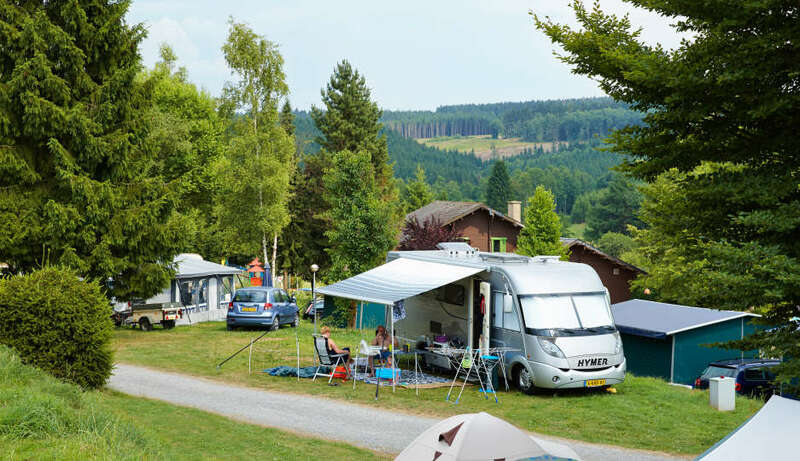 At Camping Petite Suisse, a maximum of one pet per camping pitch / rental accommodation is allowed. There are also pet-free rental accommodations and pet-free camping pitches. The cost for a pet when booking a rental accommodation is all year round € 7,50 per night (except packages). For bookings on a camping pitch, the costs are € 2,00 up to € 4,00 per night (depending on the period of the year). At Camping Petite Suisse day guests and visitors are allowed. They must report on arrival at the reception. The price for a day guest is € 3,00 per day per guest. If they want to stay overnight on a camping pitch they must pay the extra person fare (€ 3,00 to € 6,50 per person per night) and the tourist tax (€ 1,25 per person per night). When visitors want to stay overnight in an rental accommodation they must pay the costs for bedlinen (€ 7,50 per person) and the tourist tax (€ 1,25 per person per night). At Camping Petite Suisse you can use free Wi-Fi in and around the mail building. So you can surf the internet for free on the terrace, around the pool, in the restaurant and around the playground. A paid WiFi network is offerd on site. At Camping Petite Suisse one car is included at the price for the campingpitch/accommodation. A second car can be parked at the car park just outside the campsite for € 3,00 per night. Camping Petite Suisse has a heated outdoor swimming pool, whitch is divided into three sections so that everyone, young and old, can enjoy themselves here. The paddling and children's pool have a slide. At the pool there are sun loungers where you can relax. The swimming pool is open from the beginning of May until the end of August, weather dependent. The current openingtimes can be requested on site. Camping Petite Suisse features a restaurant, a bar and a shop. Hours may vary in high and low season. For the current opening hours you can contact the reception.